Maybe it was just the August winds or the prime meanster simply laying false trails again, but someone sure put something in the Liberals' drinks this past couple of weeks. When federal liberal backbencher and former leadership aspirant, Bronwyn Boadicea Bishop, recently posited that the recruitment age for the ADF be lowered to 14, her suggestion received all the serious attention that it deserved. 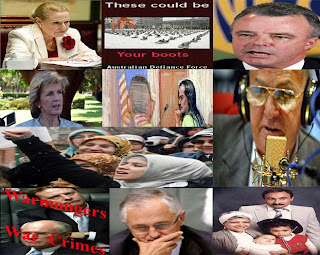 Then we had Bronwyn's namesake, the Minister for the Ageing, the blond ice-maiden member for Curtin in WA, Julie Bishop, trying to convince us that the US Court of Appeals had reviewed the Military Commission process and that David Hicks would get a fair trial. Obviously disappointed with the failure of her initiative to create new career opportunities for our youth, the keeper of cast-iron coiffure, along with her colleague, Sophie Panopoulos, last week decided to contribute to the government's efforts to encourage the acceptance of Australian values by the Islamic community, by advocating that headscarfs worn by Muslim women and girls be banned in public schools. But wittle wedgy woodrow wilson winston immediately rejected this proposal, ostensibly because it would do little to build understanding, tolerance and inclusion in our community (Schooling Value Proposition IX), but more likely because ASIO already has those concerned [scapegoats] under surveillance anyway. In the meantime, Malcolm Turnbull & Peter Costello danced the tax reform tango, keen to demonstrate their numeracy & populist style, whilst Tony the Abbott unpacked his humanitarian credentials on Geoffrey Robertson's latest Hypothetical on terrorism by renouncing torture. But the real prize performance came from Brendan Nelson, the alleged federal minister for education. Our head teacher was immensely proud of his recently launched Values For Australian Schooling program, symbolized by the iconic Simpson and his donkey. Whilst some might take issue with Mr Brylcream's program methodology and the fact that federal funding is conditional on its introduction, the community should be more concerned with the government's ongoing attempt to pollute the values space in our society, in particular when the government's practiced values are consistently at odds with those it espouses for the rest of us: it's called hypocrisy. Take the example of the good minister's discussion with golden tonsils, John Laws, last week. Laws' opening comment was as follows: Now, what about this fellow, this Mamdouh Habib, getting out there to the University of Western Sydney and speaking all the crap in the world that is really anti-Australian. How do you stop that? Now that remark clearly demonstrates great respect for Brendan's values. In particular the values of a fair go, freedom, honesty and trustworthiness, integrity, respect, responsibility and understanding, tolerance and inclusion. In one statement, 7 of the 9 values espoused by the minister were trashed by the great commentator. And what was Dr Nelson's response? Certainly he made no attempt to take issue with Laws: no siree John. Wow - let's get - em Lawsie. No suggestion that Habib be given a fair go; no suggestion that Habib should be extended the same freedom to voice his opinions as John Laws arrogantly expects; no suggestion that Law's description of Habib's remarks weren't honest; no integrity, respect, responsibility or understanding, tolerance and inclusion promoted here: just tacit endorsement of ranting, redneck hyperbole. Brendan's with John on this: he's seen the report in the Daily Telegraph. That's enough for him. Lock-up your kids: we're loaded for bear!!! And what did the Daily Telegraph actually say? The Telegraph reported only one remark allegedly made by Habib: that he'd described the US as a pack of terrorists - no other comment reported. So here's shock-jock Laws referring to Mamdouh Habib in an offensive and sarcastic fashion; accusing him of talking crap and of being un-Australian - all on the public airwaves - whilst the best our head teacher - our great proponent of Values - can do is to confirm that he's going to pursue an explanation from the University's Vice Chancellor as to why Habib was permitted to express his views. On top of that, based on a single attribution in the Daily Telegraph, the minister accuses Habib - again on the public airwaves - of having pedalled his anti-American view of the world. Some Values: who's doing the pedalling? It might come as a shock to the minister, but there are those in our community and the US who are capable of making a distinction between the criminal actions of the US government and the American people. It might also come as a shock to the education prefect that his government does not represent the views of all Australians: far from it. It might come as an even bigger shock to the minister to learn that there are many in the community who would agree with Habib's remarks and if not, certainly his right to his point of view. As minister for education, it is entirely reasonable for the community to expect that Dr Nelson would be familiar with the history of US militarism dating back more than a century, including its repeated & ongoing acts of terrorism around the world. Maybe if Dr Nelson had been locked-up by the US government for 3 years without charge; tortured and abandoned by his government, whilst constantly being vilified by politicians from the safety of their coward's castle, his views might be closer to those of Mr Habib? And given this performance by Dr Nelson, what will our students make of his Values For Australian Schooling? Well, if experience is anything to go by: not a lot. Like most kids anywhere, they'll doubtless learn more from the behaviour of their families and real leaders in our society. Fortunately kids are pretty good at spotting hypocrites, particularly when they are phoney politicians interested only in the pursuit of their own self-interest. Pity their parents aren't always as smart. AUSTRALIA: The fascist federal treasurer has drawn a rebuke from teachers for warning them against spreading anti-Americanism in schools and suggesting it could mutate into anti-Westernism and terrorist attacks against Australia. Young people could soon receive direct SMS messages from the Australian Defiance Force (ADF) encouraging them to die for their country. But they won't tell them they'll be participating in illegal and degrading wars.